Some people find themselves wanting to test others in order to learn how strong-willed or dependable they are. This isn’t always a quality that others find comforting, since they often feel like they are constantly being tested or asked to prove themselves. Their intentions are often sincere, sometimes coming from a fear of trusting the wrong people. 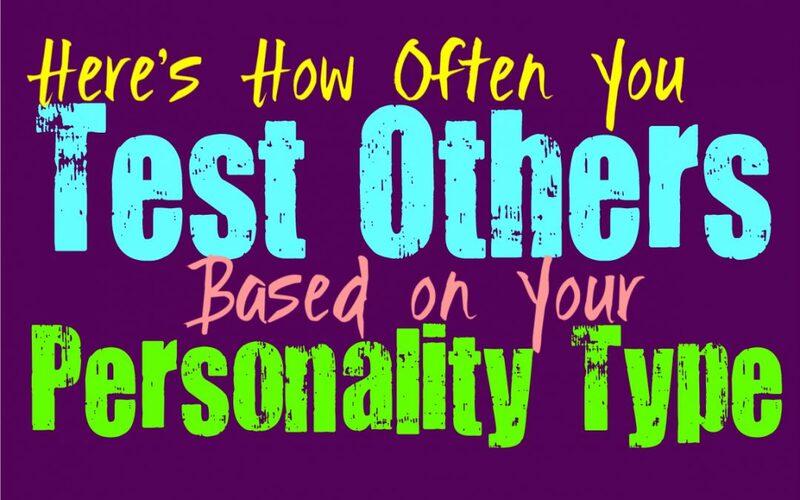 Here is how often you test others, based on your personality type. INFJs don’t like testing others, instead they just like to pay attention and get a read on who they are. They use their intuition and their connection with others to get into their minds and hearts and understand them on a deeper level. INFJs don’t usually like to test people, instead they want to get a grasp of who they are before moving forward with them. When the INFJ does feel a deep connection with a person the last thing they want to do is push them away by trying to test them constantly. They are intuitive people who can often figure out who they should and should not trust, whether or not they rely on that intuition is up to them. ENFJs often don’t like testing others, and can be truly frustrated if someone does this to them. They prefer to get to know someone on a deeper more sincere level, and will try to listen and understand them. ENFJs have a strong sense of empathy and intuition, which helps them to understand others and to get down much deeper than the surface. For them it is better to uncover someone’s layers by working at it, than by trying to test their sincerity or loyalty in a pushier manner. People who set up schemes to test people often feel a bit cruel and even shady to the ENFJ. INFPs definitely don’t test people to try and understand them, most of the time they want others to open up willingly. Instead of trying to push someone in a direction or find ways to test their behaviors, INFPs want to find people who are comfortable enough to share themselves. INFPs want sincere connections which hold a deep and sincere meaning to them. Having to test another person to see their loyalty and reliability, just isn’t a truly rewarding way to find out who they are. INFPs often enjoy the process of peeling back the layers and uncovering another person’s deepest and darkest secrets. ENFPs do sometimes like testing people, but mostly to see where their boundaries are. They have a knack for pushing buttons in order to see how someone will respond to their behavior. Sometimes it is done in order to test and read that person, while other times it can simply be for entertainment. ENFPs can become bored rather easily and need to find ways to occupy their time, the more cooped up they are the worse it can become. On occasion ENFPs will test people in order to find out more about them and how they tick, but most of the time they enjoy getting to know them in a more intimate manner. INTJs actually do test people as a means of understanding them and knowing where their limits are. They often want to learn more about someone before letting them into their lives, which sometimes requires putting them through some subtle tests. They might ask certain questions, or expose people to situations which test them in some ways. INTJs don’t do this to be cruel or controlling, they just can be rather scientific with their means of understanding other people. They aren’t emotional and don’t have a knack for reading the feelings of others, so sometimes they do require test as a means of understand them and their reliability. ENTJs do sometimes test people just to learn more about them and how well they can be trusted. ENTJs are logical and practical people, and so these are the tools they use to understand others. They simply don’t find it natural to read the emotions of those around them, instead they find other means of understanding them. It often requires putting them through certain tests in order to see where their boundaries and their morals truly are. ENTJs have a hard time really letting people in, and so they want to be sure before making this next step. INTPs definitely test others, even though sometimes they don’t even realize they are doing it. They often need to understand others but they don’t find it easy to read their emotions or really uncover certain things about them. This can require a more scientific approach, which is how INTPs operate most of the time. They often find it more effective to test people and push their buttons in order to figure out where their boundaries and morals truly are. INTPs can also have a hard time trusting what people say, so they want to find ways to figure out what the truth is. ENTPs do sometimes test people in order to understand them and learn more about who they truly are. They can have a hard time actually trusting new people, and so this is why they often feel a need to test them. In order to truly understand someone and how they operate, the ENTP wants to find ways to push their buttons and uncover the truth about who they truly are. ENTPs often find ways to test them and put them in situations which require that person to expose the more sincere parts of themselves. ISTJs don’t often feel the need to test people, not in a subtle or secretive manner. They are more likely to be open about their goals and desires for the relationship, which helps them avoid any confusion. ISTJs really don’t like having to go through the effort of testing someone, or trying to force them to be sincere. Instead ISTJs pay attention to the actions of those around them before coming to conclusions about who they truly are. Once they have come to realize they can trust and rely on someone, then they will chose to commit to their connection. ESTJs don’t usually like having to test people, they prefer to have things out in the open. When the ESTJ cares for someone they want to be sure they can truly commit to and trust that individual. This often just takes time for the ESTJ to realize whether or not someone is reliable. They respond more to actions than to words, and will pay close attention to how someone behaves naturally. They don’t often feel like they need to test others in an undercover manner, instead they would rather be more honest about it. ISFJs don’t like testing others, but they rarely need to. They would rather pay attention to someone’s behavior and emotion needs, since this helps them reach a better understanding of who they are. ISFJs don’t need to scheme and put together tests in order to understand someone and their motives, this often comes naturally for them. They are very people focused and do best just allowing their sense of empathy be their guide in reading those around them. ESFJs don’t usually feel the need to test people, since they can understand them just by observing. ESFJs have a strong sense of empathy, which helps them to understand and connect with people on a much deeper level. They are often skilled at reading the emotions and desires of others, and this helps them to achieve a sense of understanding about who they are and what their intentions might be. ESFJs don’t feel the need to test people in order to understand them, instead they take a more empathetic approach. ISTPs don’t usually find a need to test people, they have a much more go with the flow attitude about things. They want to make connections and get to know people without having to find ways of testing their motives. ISTPs simply pay attention to how people behave, and will be able to see if their actions match up with their words. For them having to test people just feels like an exhausting waste of time and energy. ESTPs don’t usually like to test people, they just want to make connections that feel sincere and fun. They want to find people who will be there for them, and stick it out even when they are a bit chaotic. ESTPs are more drawn to excitement than anything else, so for them testing people doesn’t seem necessary. They might even find themselves more interested in people who are troublemakers, since it can really shake things up in their lives. ISFPs don’t usually feel the need to test people, instead they just want to get to know them at their own pace. Testing people often feels a bit forced and even a bit shady for the ISFP. They want to find people they can connect with and build a real relationship with. ISFPs don’t enjoy the idea of having to push other people’s buttons and test them in order to find out who they truly are. They would rather allow things to happen naturally, and will try to see how things go in the moment. ESFPs don’t usually test people, instead they want to get to know them in a more sincere manner. They enjoy making connections and will be more interested in just going with the flow. ESFPs value their relationships deeply, but having to test people often feels a bit insincere for them. ESFPs would rather everything be upfront and out in the open, instead of constantly having to hide things from another and work to uncover the truth.